STEVE TORRENCE CAN’T HOLD OFF VANDERGRIFF JR.
March 11, 2012 -- Steve Torrence couldn’t hold off a closing charge by Bob Vandergriff Jr. in Sunday’s first round of the Tire Kingdom NHRA Gatornationals at Auto-Plus Raceway at Gainesville, Fla. 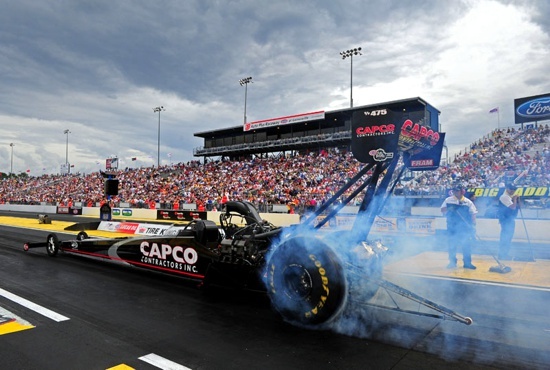 The Torrence Racing/Capco Contractors Inc. Top Fuel dragster was in front for about half of the 1,000-foot race before Vandergriff pulled ahead for good. His winning time was 3.832 seconds at 321.50 mph. Torrence followed with a 3.844 at 314.90. “That was a tough one,” said Torrence. “We obviously thought we had a good race-day combination, but the car slowed down. “Hey, we’re still a new team. This was our third race this year and the sixth overall . . . and we are getting better and better. We’ve qualified in the top half of the field twice (third at Phoenix, sixth here). We want to be solidly in the top 10 at the end of the (17-race) regular season. There’s a long way to go.